^ a b Rainer Hutterer, "Family Talpidae," Mammal Species of the World, (3rd ed. ), Volume 1, Don E. Wilson & DeeAnn M. Reeder (ed. ), Johns Hopkins University Press, 2005, pp. 300-311. 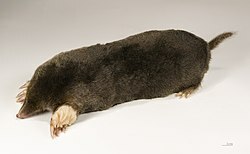 ^ “Organization of the somatosensory cortex of the star-nosed mole.”. J Comp Neurol 351 (4): 549-67. (1995). PMID 7721983. ^ 相良直彦 (1998). “【原著論文】きのこを手がかりとしたモグラ類の営巣生態の調査法”. 哺乳類科学 38 (2): 271-292. https://doi.org/10.11238/mammalianscience.38.271.